Companies in Ottawa and Chicago are using drones to scare away birds carrying diseases that could threaten human health. The “Goosebuster” clears geese off of Petrie Island adjacent to the city of Ottawa, said creator Steve Wambolt. The geese are confused by the drone, mistake it for a predator and fly away to nearby marshlands. Their droppings contain E.coli, a bacteria that can be harmful bacteria. Ottawa city officials recently granted Wambolt a three-year contract to patrol the area during the summer. Wambolt is the owner of Aerial Perspective, a company that advertises high-definition aerial photos of structural damage and real estate. He built a 6-rotor drone for the Petrie Island job, costing him $6,000. He said the advantage of using this model is its stability. Getting insurance to operate the drone was expensive, he said. His policy costs $3,000 per year and covers him anywhere in Canada. And obtaining permits in Canada can be tricky. He would have to apply for a permit specific to each city to franchise his business. Currently his services only extend to Gatineau, Quebec, clearing geese for the same reason. “I can use my Transport Canada permit in the Ontario flying region – this includes Gatineau, Quebec – but would not include Montreal,” he said. Wambolt isn’t the only one chasing birds with drones. A Chicago-based company called Bird-X is using a “BirdXPeller Drone” to scare gulls and pigeons away from businesses along the shores of Lake Michigan. 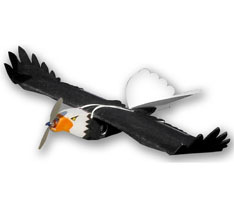 The drone looks like a bald eagle with a propeller as its beak. In operation for over 50 years, Bird-X offers pest control products globally. Tom Olmstead, the company’s national account manager, says the birds invade warehouses containing produce. Workers find it difficult to get rid of them. The bird droppings pose a health hazard and are corrosive to the buildings, he said. That’s when Bird-X gets involved. “If the FDA finds contaminated birds in food processing and food manufacturing facilities, the businesses could be shut down,” Olmstead said. But the company hasn’t applied for a permit through the Federal Aviation Administration yet. Permit requirements in the United States are in dispute. Dennis Tilles, president of Bird-X, said the company does not need a permit from the Federal Aviation Administration but is required to carry an insurance policy for the drones. But Thomas Rampulla, an aviation safety inspector for the Federal Aviation Administration said a permit is required for such commercial businesses. “Commercial use is permitted if the aircraft manufacturer has obtained proper certifications for their aircraft,” he said. Air power isn’t the only unusual way to get rid of pesky birds. Dogs can also tackle the job. Elizabeth Alm, a Central Michigan University biology professor, researched the use of collies to clear the gulls off the shores of Lake Michigan. The study was funded by the Environmental Protection Agency’s Great Lakes Restoration Initiative. Are drones or dogs most effective? Alm thinks both methods are an asset, depending on the circumstances. And bird droppings are not the primary problem for Great Lakes beaches, said Shannon Briggs, a toxicologist at the Michigan Department of Environmental Quality. Drones can’t control human sewage. “Drones are not likely to be helpful because sources [of contamination] are typically underground or flowing in creeks, drains, rivers, streams, etc.” Briggs said. However, Briggs thinks drones might be useful to help manage debris that is visible on the surface and for scaring excessive numbers of birds.